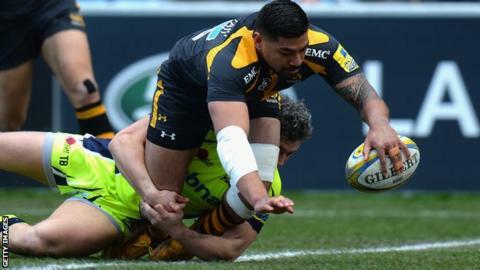 Wasps ran in five tries at the Ricoh Arena as they thrashed Sale to boost their Premiership play-off hopes. The hosts dominated the first half as tries for Charles Piutau, Rob Miller and Ashley Johnson secured a 25-0 lead. Sharks rallied through scores from David Seymour and Neil Briggs, but Jimmy Gopperth then crossed to add the try bonus point for the hosts. Christian Wade danced through for their fifth before Sale centre Johnny Leota was sent off in a scuffle late on. Wasps also finished with 14 men as Tom Bristow was sinbinned for his part in the same incident, Jake Cooper-Woolley having also been yellow carded earlier. Dai Young's side, who have only lost twice in 2016, continued their impressive form since the turn of the year, having now won a sixth home game in a row. Sharks fly-half Danny Cipriani faced his old club for the first time since agreeing to re-join them next season, but struggled to impose himself on the game. He did reach the milestone of 1,000 Premiership points when he converted Seymour's try, while the man he will be competing for the number 10 shirt next year, Gopperth, impressed with 17 points. Wasps remain in third behind Exeter and Saracens, four points clear of fourth-placed Leicester. Despite being the only Premiership team unbeaten at home this season, Sale's away form is hampering their top-six hopes, having won just once on the road. "I certainly would have settled for that before the game. You can't get any more than five points, and we've achieved that which keeps the momentum going. "We talked about starting really big in the first 20 or 25 minutes, as if you look at the stats that is usually Sale's best period. "We became a bit individual and came out of structure a little and allowed them to get back into it in the second half. I was getting a bit concerned when they scored their second try, and we found another gear." "We were convincingly beaten by a better side on the day. They have lots of big, powerful runners we couldn't contain and combined with our first-half error rate they went in 25-0 up. "We just got our noses into some competitiveness in the second half, then they stepped it up again and we couldn't compete. "Wasps are a good side who have knocked a few people around and will carry on doing that. They were more physical than us and our error rate let us down." Wasps: Miller; Wade, C Piutau, S Piutau, Halai; Gopperth, Robson; McIntyre, Johnson, Cooper-Woolley, Cannon, Myall, Young, Hughes, Jones (capt). Replacements: Festuccia, Bristow, Swainston, Rowlands, Rieder, Stevenson, Jackson, Macken. Sin-bin: Cooper-Woolley (44), Bristow (73). Sale: Haley; Brady, Leota, Jennings, Edwards; Cipriani, Stringer; Harrison, Briggs, Mujati, Mills, Ostrikov, Lund, Seymour (capt), Easter. Replacements: Neild, Flynn, Parker, Ioane, Fihaki, Mitchell, Ford, James.